Hello there! 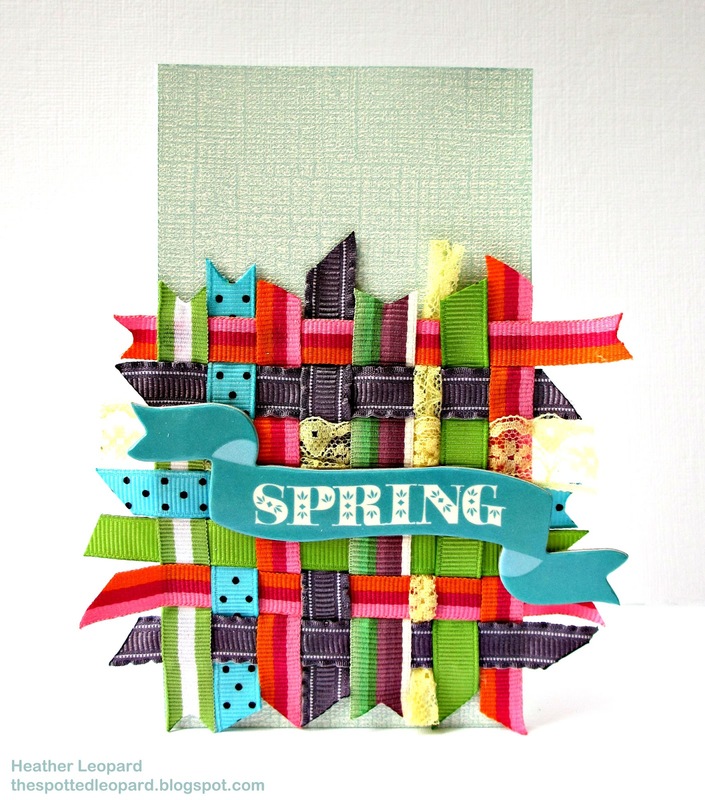 I've been having a ton of fun with ribbon in my scrap room lately. Wanna know why? Imaginisce just came out with this really cool ribbon cutter and sealer and it has made my life so much easier. It's called the i-magicut. I have to be honest and tell you that I was skeptical at first. I can cut my ribbon with scissors and I know how to heat seal my ribbon, but........I never cut it perfectly, especially when I try to cut it banner style (live a chevron) and, and this is a big and, I either don't have my lighter handy to seal the edges and it frays OR, I apply the flame and it melts my cut and warps it all up and I have to try again until I get it right. I know I sound like a commercial and I don't mean to be but this tool is just so cool because it cuts it and seals it great each time. Okay, so I got crazy with the tool and just started cutting away at the ribbon and created this Spring card. I wanted to really test out the i-magicut with this project and it definitely got a workout. 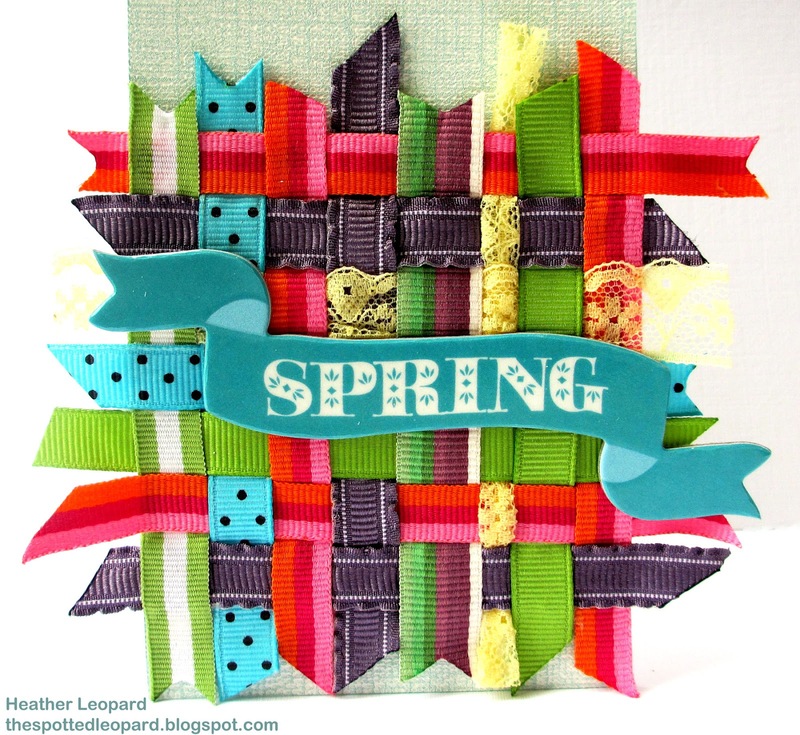 What better way to showcase small strips of ribbon than to create a weave? To make it I adhered the bottom right corner horizontal and vertical strips of ribbon. Then I just worked my way across the bottom overlapping and adhering the vertical strips. Once I had all the vertical strips placed, I weaved in the horizontal strips, double checking that I wasn't skipping under/overs as I went along, and I did have to re-do a couple. After I laid my last ribbon, I tightened up the rows and adhered the edges with fabri-tac. Head over to the Imaginisce blog today and each day post through Thursday, where you'll find video tutorials and you can even try to win one for yourself. wow this looks like you had a GREAT time making this DETAILED card! AWESOME! What a cool little tool to have!! I'm always complaining and cursing about my ribbon fraying, etc. Love this!